There is no easy way to estimate how long a complicated divorce will take; it varies depending on the unique circumstances of each case. A contested divorce will generally take longer than an uncontested divorce. A divorce with significant assets or substantial debt will take longer than a divorce with limited assets and debts. While it is possible for a very simple divorce to be finalized within a few months, other divorces can span as long as two years or more. A contested divorce is one in which the husband and wife cannot agree on some or all of the issues. For example, both parties might be fighting for custody of the children or disagree about a parenting schedule. The parties might disagree about the amount of alimony to be paid or the division of certain bank accounts. Whatever the reason, if divorcing couples cannot agree on certain issues, then a judge must take testimony and collect evidence in order to make a decision. Contested divorces take much longer than uncontested divorces because of the significant back and forth that occurs between the parties with respect to each disputed issue. With contested divorces, the court generally sets forth a schedule of various phases that must be completed. The initial phase is the information-gathering phase. This is when the attorneys collect documents and learn about the background of the marriage. This helps the attorneys prepare for the next phase, which is the discovery phase. This is when each side is allowed to request information or documents from the other side. If you suspect that your case will be contested, the discovery phase is when you gather all of your evidence. The next phase is the settlement phase. After each side has all of the necessary documents and information to fully understand the case, the parties will be encouraged to try to negotiate and reach a settlement. During this phase, the court may hold pretrial conferences where the parties or their attorneys meet with the judge to discuss the case. The final phase is the trial phase. When all else fails, contested cases that do not settle must go to trial. 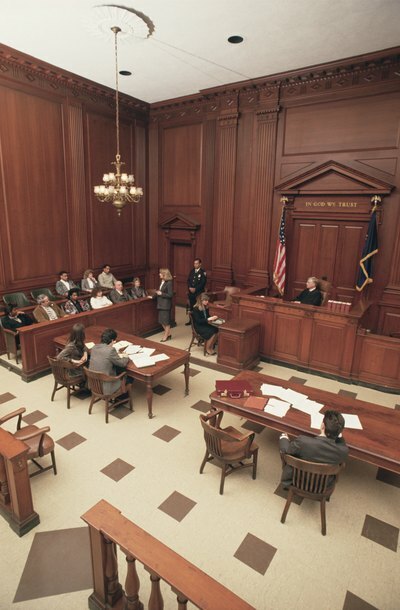 During a trial, witnesses are called and evidence is provided to the judge, and ultimately the judge makes a decision at the end. It may be necessary for the court to enter some temporary orders early on regarding how things will be handled during the divorce process. For example, a judge might order a husband to pay temporary child support until the divorce is finalized or order a husband to keep paying certain bills. Another common temporary order is one where a judge restrains both parties from draining any bank accounts or spending any unnecessary savings money. If your case requires a temporary order, the other phases of your divorce will not usually start until the temporary order is in place, which further extends the time it will take to finalize your divorce. During the discovery phase, there are some common methods of gathering information. One method is called interrogatories. Interrogatories are lists of questions that one party gives to another party. The other party must answer the interrogatories, usually within one to two months. Another common form of discovery is a request for the production of documents. This is when one party asks the other party to provide various documents, such as bank account statements, credit card statements or tax returns. The other party usually has 45 days to two months to provide the documents. If the documents are extensive and date back for many years, the response time can take as long as three to four months. Finally, the taking of depositions is a common discovery method. Depositions are when one party meets with the other party or a particular witness and asks them a series of questions under oath. The answers are recorded and transcribed for possible use later on at trial. Depositions only take a day or so, but preparation for them can take months. All of these discovery methods can lengthen the time it takes to finalize your divorce. After the discovery phase is over, most divorce cases move on to a settlement phase before going to trial. During the settlement phase, the parties or their attorneys will negotiate back and forth and attempt to reach an agreement. The parties may also attend mediation or meet with panels of experts who will help them try to settle the case. During this phase, the judge may also require pretrial conferences where the attorneys meet with the judge to provide case updates. The judge may give his off-the-record opinion of the case in an attempt to help the parties settle. The settlement negotiation phase can take up to two months, although most states will not allow cases to stall for too long during this phase. When all else fails, parties will go to a trial to settle their divorce case. Trials can take anywhere from days to weeks depending on the complexity of the case. If many witnesses need to be called, this can extend the length of the trial. If there are excessive assets or debts to be divided, this can also extend the trial because evidence needs to be entered with respect to each of these things. Sometimes parties are able to resolve all issues in their divorce except for one or two specific issues. If this is the case, it is possible to have a limited trial on just those issues. Typically, a limited trial can be finished in about one week. Even after a trial, many divorce cases do not automatically end. If a case is complicated, it can take the judge weeks or even a month or more to make his ruling. Also, many states have mandatory waiting periods during which a dissatisfied party can appeal the judge's decision. This period can last as long as three months. Although it is possible to be divorced on the day of your trial, in most circumstances a divorce can linger on for months after this time. CivilizedDivorce.com: What is a pre-trial conference? McKinley Irvin: How long does a divorce take? The role of a judge in a West Virginia divorce is to resolve all contested issues between a married couple. Although the state requires parties to meet certain basic residency requirements, the length of time it takes to obtain a divorce depends greatly on how quickly the couple can reach agreement before coming to court. In cases where the appropriate paperwork has been filed and parties can fully agree, a divorce can often be granted as soon as the court has an opening in the docket. Divorce cases can vary from quick and smooth when spouses agree to long and difficult when they don’t. A Kansas divorce can take anywhere from two months for an uncontested case to a year or more for a contested case. If you and your spouse can reach agreement on most of the terms of your divorce, the process will usually be quicker and less expensive.